For a long time, I had no interest in makeup. I felt like it was something people wore because of shame or to hide their flaws and feel shame, but I have recently made a new relationship with makeup and I want to share that with you. Makeup is about art and color and enhancing the things you love about yourself. I do not think anyone should be made to feel like wearing makeup is the only thing that will ever make them "enough", but I do think if you want to wear makeup for yourself and no one else, then you should do it and not worry about the "right" and "wrong" ways to do it. In the past year or so, I've done a lot or research to unlock the mystery of makeup application. I've read countless blogs, tutorials, and product reviews...and it is kind of complicated when you have so many different products on the market and you are trying to separate a good ad campaign from the product. My make up collection has become vast and honestly a little out of control and I have tried the dollar store brands and the high end pricey brands and I have learned a few things that I would like to share with you. Decide what kind of things you want to achieve with makeup. Set some goals and decide what you like and don't like. If you don't like wearing mascara or putting it on, then don't buy it...sure, it's an "essential" to most people, but it is worthless if it doesn't make you feel good and you can always change your mind and try it out later. Don't let other people's rules about make up (including mine!) dictate your experience. +If you are going dramatic, try to pick either the eye or lip...doing both can be overwhelming. it's nice to do a subtle eye with a dramatic red or bright pink lip or a dramatic colored eye with a glossy simple lip. +There are a few drugstore things that you don't have to spend a fortune on and then there are some items that are worth the extra money. I will try to go over a few of those things in upcoming posts. Always trust your gut, only buy what fits your budget that you think is really worth it, but also don't be afraid to splurge a little on yourself! 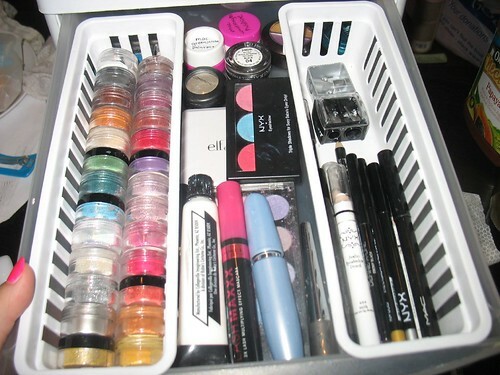 +A makeup collection takes time to build, don't get frustrated or break the bank all in one week. Pick a few things you want to learn about and collect those things over time. I personally decided to start with eyes...I wanted to master the eye make up first, so I collected a whole bunch of shadow colors to play with, then liners, mascaras...then I moved to learning about other things like new lip products and face products. It was a gradual process for me. +Shop the sales! Drug store brands have a lot to offer and usually there are weekly specials like buy one get one free and that is a great time to try some things out. +If you are not used to wearing makeup, bright colors might scare you at first and that is ok. The colors probably do not look bad on you, it can just be weird do see them on your face at first, so give yourself some time to get used them before you decide you hate them. And if you decide bright colors are not your thing, that is ok too...neutral colors can be used to make your face pop in different ways and really enhance the things you love about yourself. +Makeup is not permanent. Take some time on a causal night in a fool around with it. It's easy to clean off. +Get yourself the right tools. Brushes really are just as important as the products you are using...maybe even more important in a lot of cases. If you want to make some fancy eye shadow magic, it's just like a painting, you need some brushes that will make the look. They don't need to be fancy brushes, just get yourself a cheap set and learn about which brushes work best for which looks. I am not sure if this is very interesting to any of you because it's not exactly the kind of thing I normally write about, but I would like to make a short series of posts in the next few weeks about make up tips, thrifty tricks, and general information. Is there anything in particular you are dying to know about?